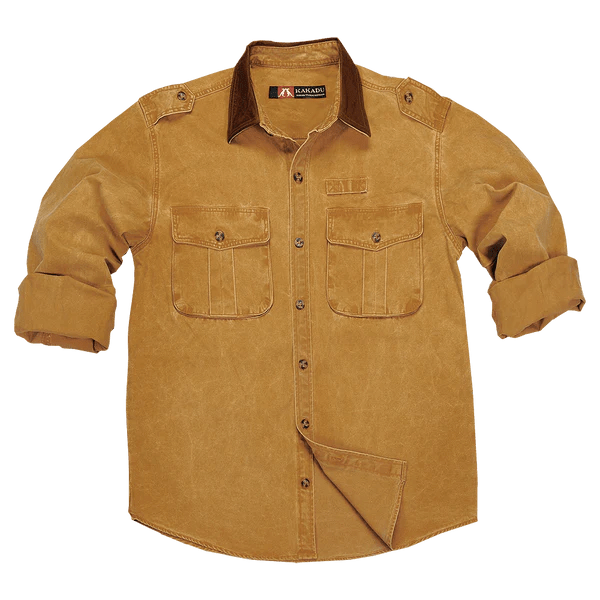 By now you’ve heard about Kakadu Traders Australia and their line of men’s canvas western jackets. Their Gold Coast and Pilbara jackets are so popular we can’t keep them in stock. What you probably didn’t know is they produce a nice line of oilskin coats and jackets as well. The oilskin canvas material dates back to the old lighthouse keeper days. They needed something to protect them from the wind and the rain. Kakadu’s oilskin canvas is not only waterproof and windproof but it is also fully breathable too. I can tell you first hand that this is the best bag for traveling on an airplane. The main compartment has so much room and the individual pockets make it so easy to use and access your important personal items. You don’t have to worry about shoving it in the overhead storage units because it will fit snugly under the seat in front of you. 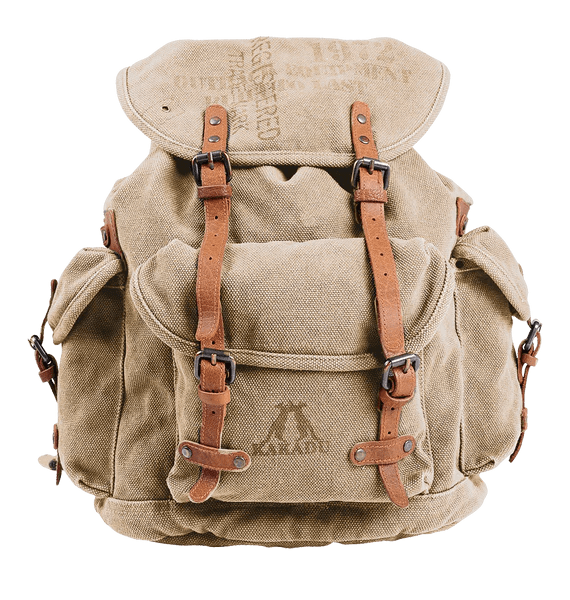 These bone or tobacco colored Kakadu Backpacks are available to ship today. The 12 ounce canvas mustard colored shirt by Kakadu Australia is now available to ship to you. All sizes from extra small to 3XL are available to ship today. It may be too hot to wear this heavy weighted shirt in the summer but you will want to jump on this opportunity to get this shirt now to have in the fall as an awesome over shirt. You will love the ample storage front pockets. You will love the comfort and design of this new Kong Harness. It’s a canyoning harness that combines the comfort of a mountaineering harness with resistance and shape necessary for caving and canyoning. Provided with special front attachment point that allows the fitting of a quick link to connect the chest ascender in a lower position – during the ascent phase, for each push you get 10/15 cm more. Now available in all sizes black or brown. Free shipping too! These gloves were originally designed for those riding horseback but they’ve also proven useful riding motorcycle or just working on the ranch. Get your Kakadu gauntlet style riding gloves today. Do you want to carry your cell phone in a secure pouch? Does that pouch need to be at least six inches long? Do you want the Rugged patented quad lock clip? Well It is here. The Rugged QX NXT cell phone pouch by Rugged Equipment. The Kong Rope Bag 100 Backpack for carrying ropes and equipment with comfortable padded shoulder straps and hook for suspension. It’s angled closing flap with ring for the suspension also ensures comfortable access to the contents of the bag. Drawstring closure and rapid clip made of ultra-durable nylon. Transparent side pocket for name plate label. Interior pocket with zip for storing small tools. Made of extremely durable PVC; reinforced bottom with slotted holes for breathability and handle for the emptying. 28 liters capacity, can hold a rope of 100 m.
At Lorsey.com we feature the Kong rescue equipment that can provide some valuable, new information to anyone who is just starting out doing recreational climbing. It is also a valuable source for volunteer firefighters and even for the common home owner. Preparing for an emergency situation is never a bad idea as it can possibly safe lives. House and forest fires can happen when you least expect it and should help take too long to arrive, having your own rescue equipment can be the difference between life and death and Kong rescue equipment ensures that you have great equipment available at hand. Hyndsight Wireless cameras have quickly become popular in the current era. They can be easily placed anywhere in an area without any tension of external wires. There are wide applications in which wireless cameras are being used. Some of the companies also offer high quality wireless cameras but most prominent in them is Hyndsight. By using the top quality wireless cameras provided by Hyndsight, a person can enjoy many benefits such as easy installation, affordability and stability. The most prominent benefit of Hyndsight camera is that it can be placed anywhere in an area and you don’t need to worry about the external wires. The powerful signals connect each camera which makes it easier to investigate any kind of activity. A top quality Hyndsight camera is also easy to install. You just have to make a hole in a wall with the help of a driller. Once you do this, it would be very easy to install a camera in any angle or direction. Hyndsight provides a large amount of cameras that have very good flexibility. A Hyndsight camera can be programmed to a wide range of settings along with the ability to move the camera in any direction. This feature saves a lot of valuable time and a person don’t need to worry about any outlets of the camera. is that if any kind of problem tends to happen, then the help from police department always comes within minutes. Moreover, the sensors installed in the monitoring systems allow a person to catch any kind of activity around him/her. In case a thief or intruder manages to enter a house, then a sharp sounded alarm would pop out as to scare the thief or intruder. While Watson AirLock bags are designed for hunters they are great for travelers, too. Imagine opening your bag at your destination and your clothing is as fresh and scent free as when you packed them in it. Watson AirLock bags hold a lot and their adjustability means they are great for a weekend getaway through an extended trip. Scent blocking technology, water resistant, abrasion resistant, the best quality fabric, zippers and webbing means a bag you will come to rely on. Get yours now.